One of my goals for the Norwegian farmhouse ale trip was to see if kveik (family yeast) still existed in Norway, and to get samples if possible. To that end I bought six little plastic bottles to keep the samples in before leaving. At our very first stop, Sigmund was kind enough to let me take two samples. I took two because I wanted to send one to the National Collection of Yeast Cultures in Norwich, UK for analysis, and the other I wanted for myself. A side benefit of sending it to NCYC is that they keep the yeast in their collection, where it's preserved for posterity by being frozen. I had to send the yeast to NCYC as soon as possible, as we had a week left on the road, and I didn't know how well kveik would survive in a suitcase in a hot car, and then in the mail. So the first hour I had to spare on the trip, in Flåm, I went directly to the local post office, which is actually in a grocery store. I hadn't thought to bring anything to send the sample in, but the staff kindly let me take a used cardboard box from the store, and lent me some other bits and pieces. So while shoppers and tourists were drifting around me I found a flat surface on top of an ice cream freezer, and went to work. I wrote a small note to Chris Bond at the NCYC explaining it was kveik from me, wrapped the bottle tenderly in bubblewrap, taped up the box, and wrote the address, etc. I felt more than a little silly doing this in public, but it was all for science. Later, in Stranda, Stein Langlo kindly gave me two dried samples of his kveik. Since they were dried I waited until I got home, then mailed them off, and settled down to what turned out to be a long wait. Chris at the NCYC got Sigmund's kveik to grow with no problems, but Stein's stubbornly refused to grow. Chris put it on agar plates, and found what to him looked like healthy cells under the microscope, but never got them to grow. Several attempts were made, and eventually I sent him the entire two samples, but even that didn't help. The first test Chris did was DNA fingerprinting. This is not full genome sequencing, but a way to test parts of the DNA. He took samples from the bottle, diluted them with sterile water, then grew them on standard YM plates. These, by the way, do not contain antibiotics. The yeast grew well, without any sign of bacterial growth whatsoever. NCYC then performed PCR analysis and DNA electrophoresis. Basically, this means extracting parts of the genome and cutting it into fragments. The length of these fragments will vary depending on the genome of the yeast. The electric field then pulls the fragments through the gel on a plate, and the length of the fragments will determine how far they are pulled. Thus, it's possible to compare which genes are present and absent. That's what you see in the photo below, from the NCYC report. 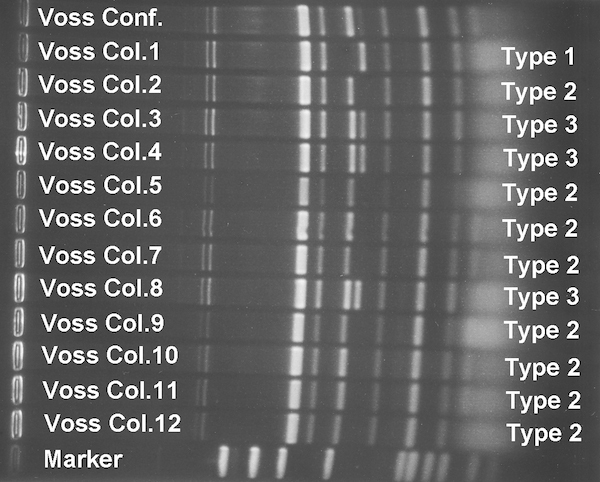 The white bands are genes which are present. When one of the rows is missing the band it means the yeast strain shown in that row did not have that gene. 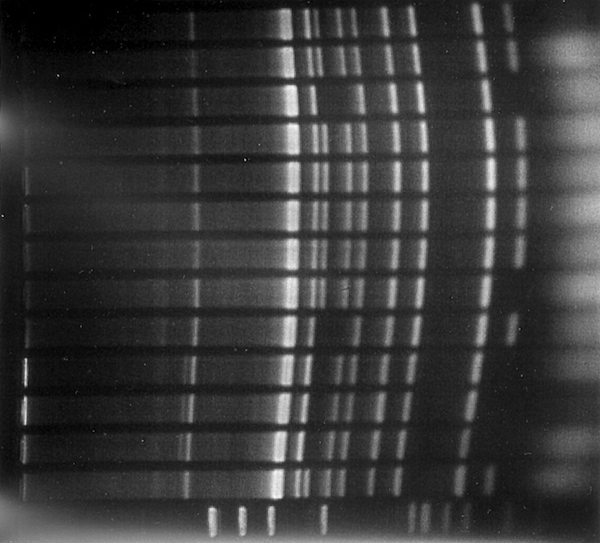 Just to the right of the first column of text you can see a double band going down the photo: apparently all the strains have these two genes. Further to the right is a big thick band, which is another gene (or pair of genes) that all the strains have. Then a thin band again present in all the strains. Then, there's another band present in all rows except one: that gene is missing in strain 1, but present in 2 and 3. A few rows have another band right after this one, and those are strain 3. Strain 1 also has this gene. And those are the differences. Based on this analysis it was clear that Sigmund's kveik consists of three closely related strains, and probably only three strains. You can in fact see this in the picture, as Chris has helpfully labeled the three strains. Another kveik, from Svein Rivenes, was analyzed in 2009, and found to likewise consist of several strains, in that case four. Comparing the genomes of the two samples it's clear that the two yeasts are related, but also that they have, as Chris put it, not "shared a common ancestor in the recent past." He doesn't say what he means by "recent past," but I'd assume it means at least a few decades. If you compare the fingerprints above and below I think you can see that they are similar, but not the same. An obvious question at this point is how far removed these yeasts are from other brewing yeasts. Where do they fit into the family tree of brewing yeasts? Can we conclude from the DNA anything about how far back you have to go to find a common ancestor to the Voss kveik and the yeasts used by commercial breweries? Unfortunately, nobody knows. I've managed to interest this lab in the issue, but they're deep in another project, so results may be a long time coming, if they decide to do a project on this at all. So don't hold your breath waiting for an answer to this question. Another conclusion from the analysis is that the sample is in fact pure Saccharomyces cerevisiae, with no contaminants of any kind, whether bacteria or other types of yeast. This is the same conclusion they came to in 2009 with the other kveik sample. Which is interesting, to put it mildly. This yeast has been handed down through the generations, simply by reusing it from brew to brew. No lab equipment of any kind has been involved. People have just taken a grayish brown goo, spooned it into glasses, stored it a few months, then thrown it into the wort, and repeated. Over and over and over again. The only thing that was known about it was that it produced good beer. Then, centuries later, the brown goo is analyzed, and turns out to be nothing but pure Saccharomyces cerevisiae. Actually, it's less surprising than it might seem. The reason brewer's yeast produces alcohol, even though this is a fairly inefficient means of producing energy compared to other available alternatives, is that the alcohol kills off the competition. Zainasheff and White is pretty clear on this: under the conditions of typical alcoholic fermentation, Saccharomyces cerevisiae "should be able to outcompete most of the bacteria present." As we have witnessed in many breweries we've worked with over the years amounts of bacteria may be present in the initial brew but once the alcohol levels begin to rise they are killed or inhibited and the Saccharomyces cerevisiae out-competes them. Hence if a sample [is] taken at the end of fermentation for use at another time it will contain only Saccharomyces. The brewing process is self-selecting for the brewing yeast. Of course, as we all know, sometimes this goes wrong, and you wind up with malt vinegar or worse. But it must be remembered that there are people with taste buds involved in this process. When the kveik gets infected the farmhouse brewers throw it out and get better kveik from somewhere else. Sigmund told us one of his neighbours had kveik that had gone sour, and he kept persuading the guy to throw it away. Over time the brewers do switch to sound kveik and thus keep their strains pure. The full report is also available. As described earlier, Svein Rivenes's kveik is available from the NCYC. Sigmund's kveik will also be available, under the accession numbers below. To summarize what we know at the moment, the kveiks from Voss seem to each consist of a mix of 3-4 closely related strains. These are pure Saccharomyces cerevisiae and nothing else. They both produce a similar orange-like aroma when pitched at 37-40C, as does another Voss strain I have direct experience with. The Gjernes and Rivenes strains are relatively close genetically, without being the same strain. The kveik strains from Hardanger, Sunnmøre and Lithuania we still know almost nothing about. I have a lead on a possible strain in Sogn, so it may just be that kveik survives there, too. Work continues on procuring live samples from places other than Voss. If you have kveik, or know someone who does, please, please, please contact me. Or, if you're going to Vilnius, please get in touch if you're willing to mail a bottle of beer, so that we can solve the mystery of the Lithuanian yeast. Who said beer making was an amateur 'hobby'! Doesn't get much more scientific than this. I'm now waiting to see a match from yeast found in 1000 year old ... something! The logic above makes that not unreasonable! As usual, a phenomenal post. Would these strains be worth developing into a commercial strain? @Dave: Beer is definitely science if you want to approach it that way, from Pasteur's work on yeast, through Guinness's introduction of Student's t-test in statistics to the much more technical stuff done today. Anyway, I agree, it does look like these strains are ancient. What's missing is the DNA analysis that would prove it. I'm still living in hope that some day I'll find a researcher who wants to do the necessary work. @Will: Thank you. Yes, I definitely think it would be interesting to attempt developing this into a commercial strain. I'm trying to find a yeast vendor willing to make the yeast available, and they might do it. It also looks like that Belgian lab is interested in working on this. as a professional brewer I am very interested in your blog. Sounds like a very interesting yeast strain you found, would love to try it in one of my future experimental brews. I also like those yeast rings. Is there any way to get hold of one of those or maybe a DIY plan for the rings? NCYC 3545 Is the one i got from Svein Rivenes, and did send to the collection as there is a good idea to obtain and secure it before it gets lost. Also, Voss brevery uses it in their Vossing. NCYC 3545 has 7 mutations, it is not possible to say how long it has been used,but the curator said "many years"..